Email not displaying correctly? Click here to view it in your web browser. As we predicted last month, the robust October national employment numbers translated into good local employment numbers. 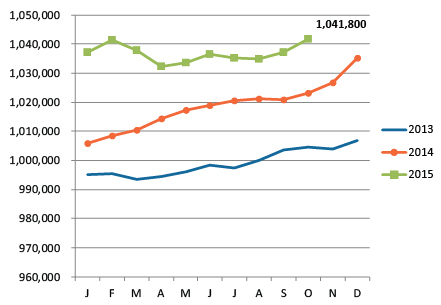 Metro employment stands at 1,041,800. This is an all-time high for the metro and an increase of nearly 19,000 from one year ago. The Health, Finance and Construction sectors were the top job-creating industries. Sometimes it is beneficial to take a long look back at where we have been. Although job growth during the recovery has been slow — and sometimes absent — we truly have come a long way. We have long since bypassed pre-recession employment peaks and appear to be on a solid upward trajectory. MARC’s economic forecast calls for continued employment growth, at an even more accelerated rate, through 2017. The region is expected to add about 25,000 jobs a year. While employment climbed, the unemployment rate dipped to 4.2 percent, the lowest level this measure has seen since 2001. 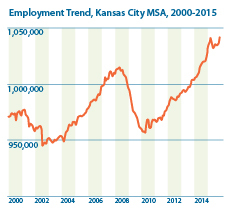 This unemployment rate places Kansas City in a middle tier among peer metros. 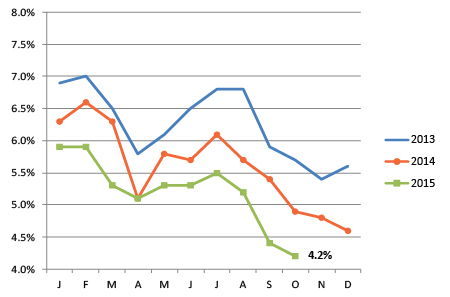 Help wanted ads dropped in October, but they still remain very strong overall. 2015 has clearly had its ups and downs in terms of our local workforce, but it appears to be drawing to a close on a positive note. There is some real momentum building in local employment, which bodes well for 2016. Regional employment jumped to 1,041,800, an all-time high. Kansas City's unemployment rate dropped to 4.2 percent. The metro unemployment rate hasn't been this low since 2001. 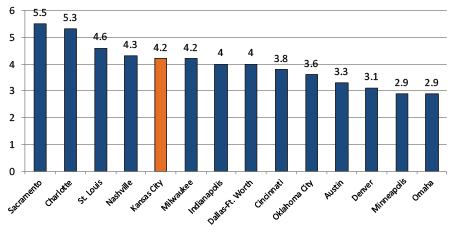 Kansas City falls in the middle tier of peer metros compared by unemployment rates. 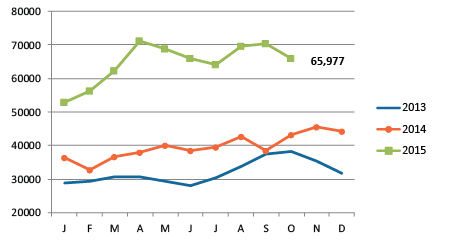 Job posting dipped in October but remains quite strong.